I love you like the crazy my kids drive me. Normally, you see, I have to walk around the house with the baby nestled happily cooing away in my arms or in a carrier in order to accomplish my daily tasks; this works out fine so long as I never stop moving. And that's where you've got me and the hundreds of dollars worth of baby carriers I bought beat; the mommy simply runs out of steam and needs a break from lugging around the 12-pound 1.5 month old. And carriers only move as much as the person they are tied to. 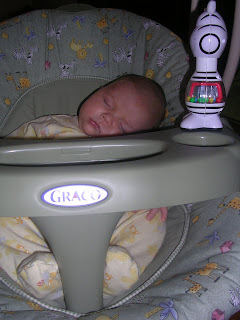 You, Mr. Graco Swing, never cease to stop moving. You are a moving machine, like, literally. And baby EJ loves that about you. I know, Mr. Graco Swing, that when my first baby was born, I carelessly tossed you aside for those baby carriers like a frat boy drops his empty beer can on the ground when he finds out there is a keg at the party, and for that, I sincerely appologize. Those years in the basement must have been chilly and dreary, but the first baby prefered those expensive, fancy schmancy carriers. I'm happy for you because this baby seems to really enjoy the cheap plastic animals that are stuck to your cheap plastic tray and your ability to never tire from continuous movement. But I just want you to know, if I had batteries, I could do that, too. So you win for now. But I'm keeping my stash of dozens of carriers because you cannot take the baby to any cool places like to park or the zoo ... but you can take him to the land of sleep and dreams during the day. And for now, I'll take it. Please don't vote to demote me from my leadership role in our group just because I've gone over to the dark side. I'm tired. I cannot move all day long. I promise to wrap baby EJ two times per day for the rest of the month to make up for my swing affinity. I swear, this whole swing thing -- it means nothing to me -- nothing! Please don't hold an intervention and confiscate all of my carriers and redistribute them to more deserving, dedicated babywearing mothers. I swear -- this is a one-time thing. It'll never happen again. Really. Carriers are awesome, but swings have their place too. ;) Swings were made for women who don't raise their children in villages...where there are numerous grandmotherly types just waiting to hold your baby. Some days, a baby swing was my village. Other days, watching PBS all day was my village, when I was sick from pregnancy or the flu. No guilt! :) Whatever makes us re-fueled at the end of the day helps evolve our children too, I think. I love the post. Sadly, neither of the wee ones did the swing thing -- Little Miss couldn't be leaned that far back without screaming and projectile vomiting (ummm yeah, we've since found out that was part of the dairy allergy - sorry baby girl!). I wish I could have done the swing sometimes. But think of all the calories you're burning being in constant motion ;) That's a good thing, right? LOL, we love you Hy! lmao! Grey spent a lot of time in his swing. Same kinds of reasons! :) Everything has it's place in mommyhood! Baby J has never been a swing lover, but in his second year of life loves it. The swing works in mysterious ways. No guilt here either...those things are a life saver sometimes! I totally agree with SB...I've had my days of using them and PBS or Starfall too heavily...and so miss the time with families where there is always someone to take up the reigns when someone else wears out! Oh girl don't fret! My kids practically lived in those swings. They were my saving grace on most days. Especially at dinner time when I wanted to eat the meal I cooked while it was still warm. Use that swing and enjoy every single minute of it! Thanks for linking up- even in all your fatigue and baby wearing days. Wow. You're a real person, not a babywearing goddess! :) I love it. That's a beauty of having a child and then having another one. All of our ideas about how we should parent get challenged. Some ideas pass the muster, some bend and some fly out the window. And another thing, this is good gossip for the AP water cooler, "Oh, did you hear, Hy posted a photo on her blog of her baby in *gasp* baby swing!"